Edmundo came round for his dinner last night, he has plans to fit taps on all the watery bits, so they can be unplugged when the big day comes and the room is emptied for the plasterer. 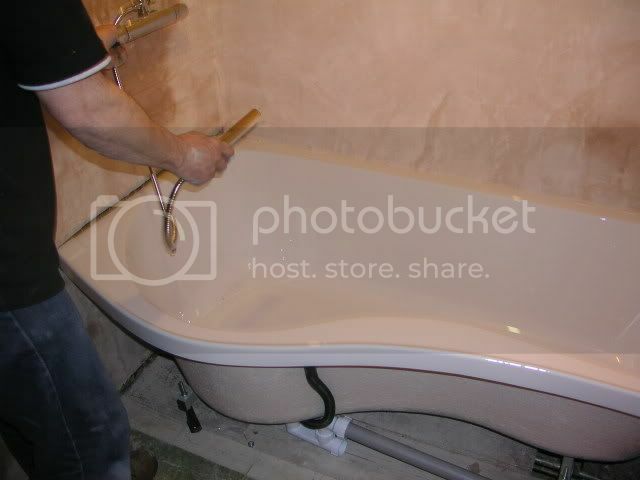 We then get the new bath in asap, the bog and sink, he makes it all sound very easy. As the new shower is powered by a pump in the loft, we won't be needing this cack any more, very low tech plumbing for the shower, as seen from the hallway. That's me on the bike in the pic, racing in the Isle of Man. The travertine tiles and bath come on Tuesday, the sparkly granite top for the vanity unit and windowsill are being cut, ready a week on Monday. stoopid question... whats a bog? 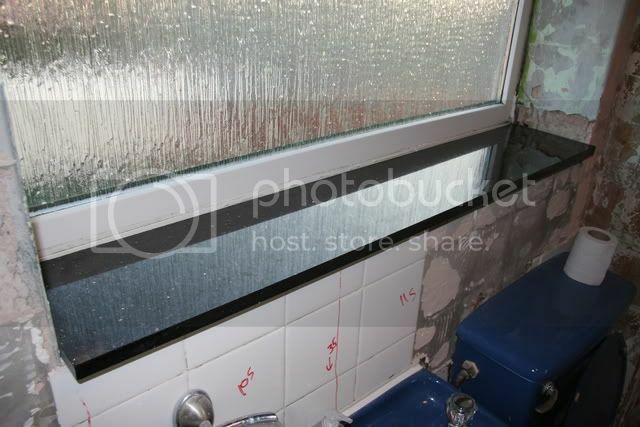 You know, the thing that struck me most from the pictures of the old bathroom is the lack of toilet roll holder. Will you be splashing out on one with the refit? @Roy, might seem like a silly question, but is your bog/sink/bath all in the same room? @ IvorGC, The bog roll holder fell off the other week, prompting me to promise Hayley a new bathroom rather than repair it. Its now in a rubble bag, we have a new one but its not going up until the wall has been replastered. @IMike, yes, why are yours separate? 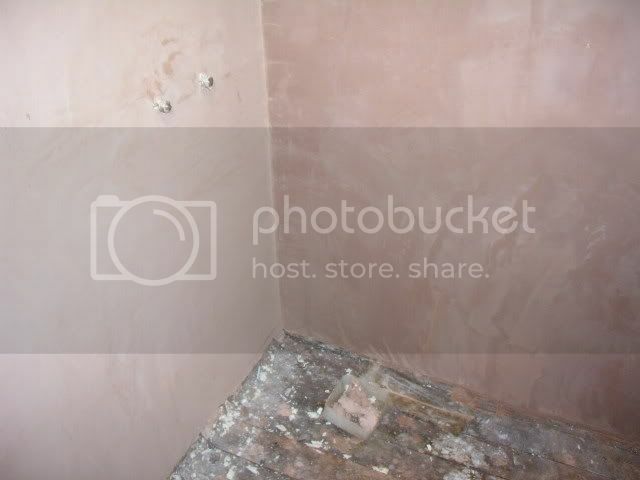 I have made a lot of mess today, I think the plasterer will be apalled to see brickwork here and there. Its not a big room, but I'm on rubble sack #5. Tomorrow we go to Costco for the heated backlit mirror I saw there last week. I must start clearing up, it's five past lager. @Roy - ours & next door's are separate. We're having the bog tiled (well, the room anyway - a tiled toilet would look silly ). Never thought about it before, but there's an airbrick in the wall above the loo (& no heating - gets bloody cold in there). 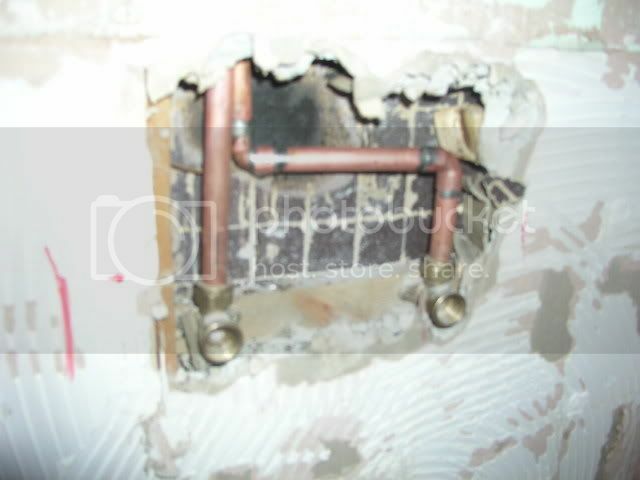 Logically the airbrick should be where the bath/shower is to get rid of steam. As far as I'm aware, it's been like that since the house was built. Looks like they changed the design at some point. Personally, I think these houses were an early form of 'bait' by the builders. All the tiles are off except for a few useful ones, around the shower and behind the sink. After shopping on the internet, many boxes and a couple of pallets have arrived, we have the travertine, vanity unit, shower pump, fan etc etc. Hayley has learned that you dont sign for things you haven't checked, I reckon the broken tiles make up for the spares I ordered, nothing we can do bacause she didnt sign for them as damaged. Meantime, the bath I bought off ebay has taken up residence in the dining room. A bit of a hiatus while we wait for the plaster dude, booked for nxt Monday. Over the weekend Edmundo & I have to sort out the wires for the elastictrickery and the pipes for the shower / taps. 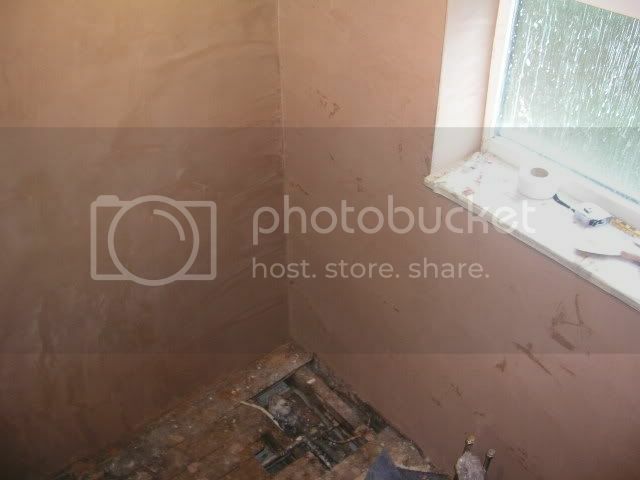 When the plasterer comes there will be a room with just a loo in it, and wires & pipes where we want them. This is all going far too well. Where is the disaster I have come to expect of Roy's renovations? There's still plenty of time for the turds to erupt from the bath plug-hole every time he flushes the crapper. Thank you for that reassurance, Slightly. I feel much better now. Cheers, I might never have started this if I'd realised I now have to shift or chuck half the forgotten junk in the attic, I just came down to eBay some of it. (And the ginger cat has just legged it up my ladder - crap! 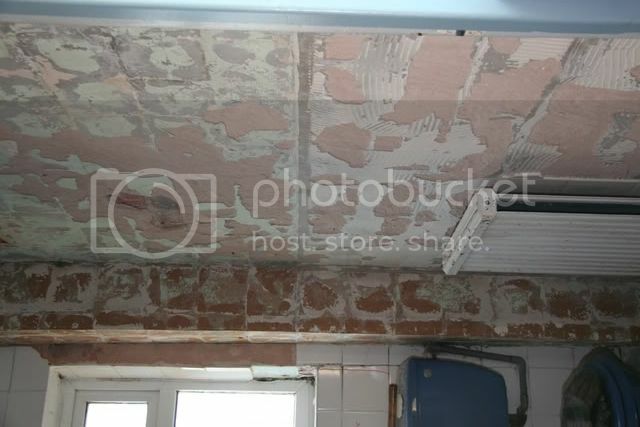 For those who want to see carnage, here's some of my subtle de-tiling, bear in mind the tiles were stuck to the green paint, on top of the plaster. I think I was getting a bit rough with the hammer and chisel here. 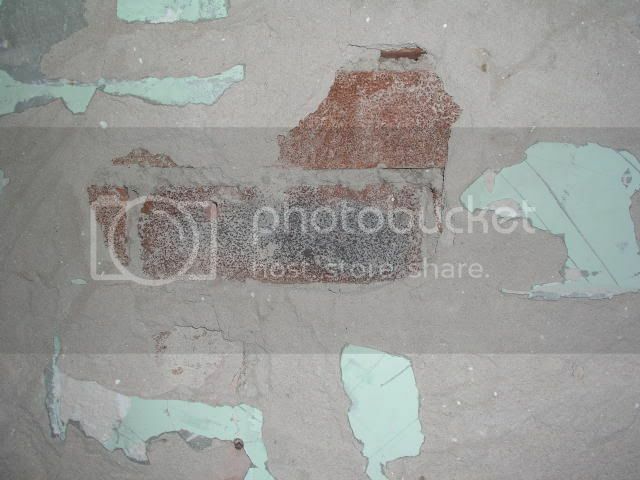 ^^^ chap who did our place ended up putting plasterboard on the walls - so much plaster came off. One wall was down to bare brickwork. All kinds of stuff got done today. The last of the tiles came off, Edmudo capped the old shower feed, the pipes were removed. 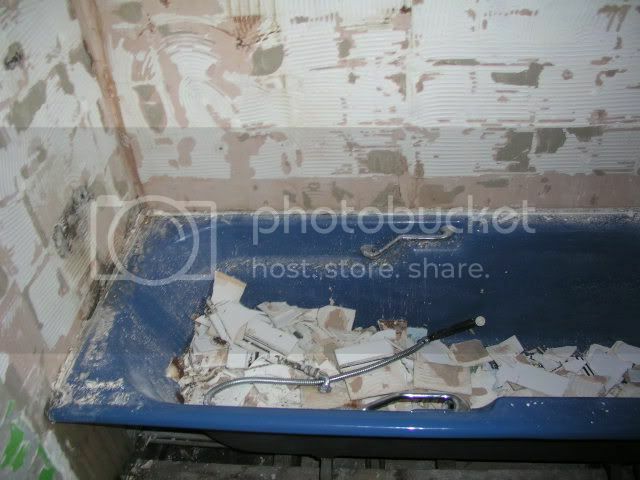 Here is the dead shower n the bath with the last of the tiles. 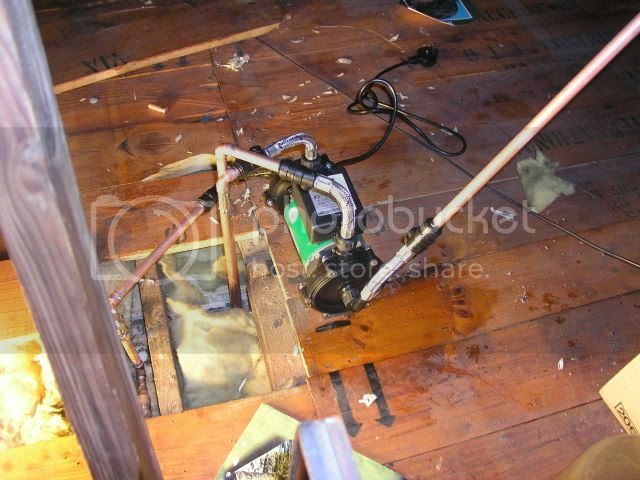 And here are my toys in the attic, the pump above the shower. The insulation burns quite well when you are soldering the pipes. 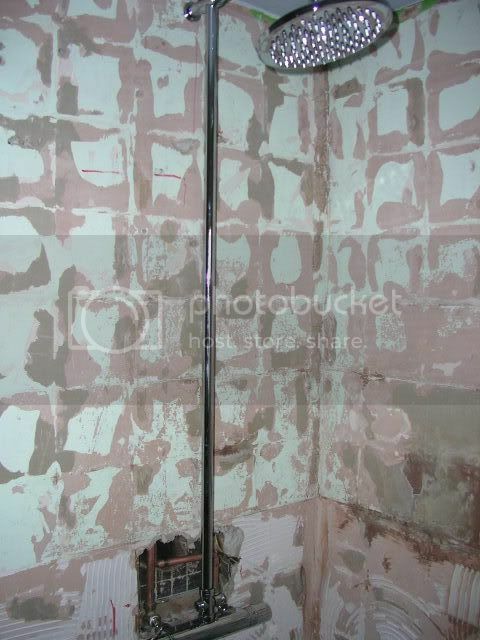 Finally the shower in place, there's also a microphone like extension for anyone who fancies showertime karaoke. 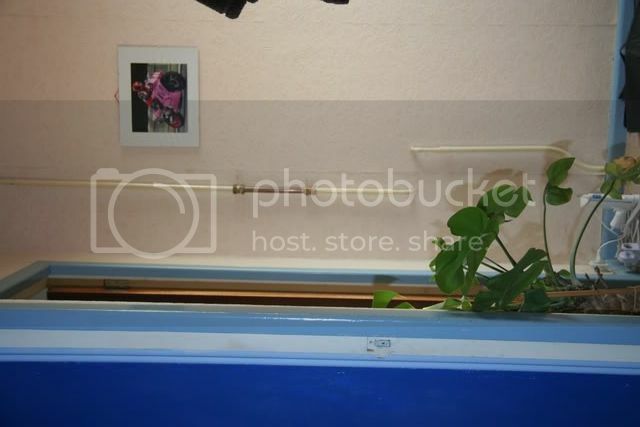 Boatofucket thinks this picture is portrait, dunno what's wrong, lie on your sides. Heres the temporary shower curtain held up by drawing pins, I'm off to have a go! The pipes sticking up were the sink, the tiles behind had to go too. 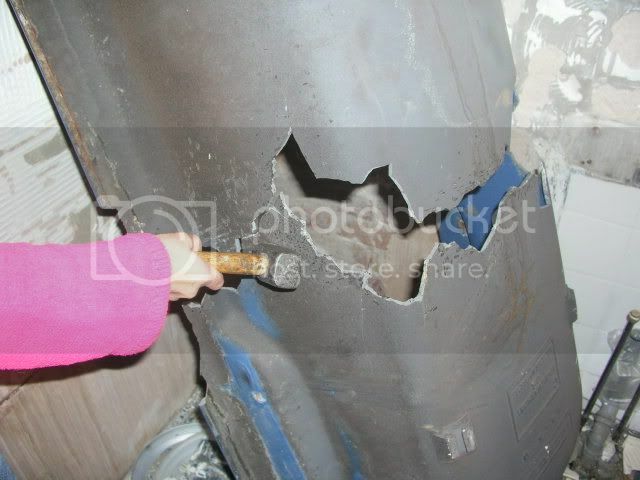 The cast iron bath turned out to be a real mofo to break in half, here's hayley getting stuck in with the lump hammer. You had to knock seven bells out of it for ages just to get a crack to start. We were half deaf after breaking it, and Edmundo and I had a real wrestle getting the 2 halves downstairs - God knows how it was got upstairs in the first place. The date it was made was cast on the bottom, sept 1979. I think that means it is younger than the house, must have been a 'home improvement'. We turned up at a friend's house clutching towels and shampoo for a shower last night. Told them we'd be back to clean our teeth later, but used the kitchen sink really. The plasterer arrived at 8am, here's here right now. I'll get a couple of pix when he's finished. Plan is to bang on a couple of coats of any old paint first, then the Dulux. 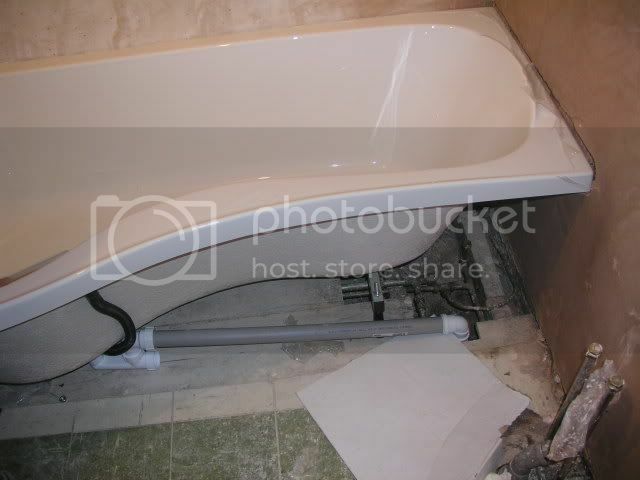 The plan to move the old bath in being abandoned (due to it being too heavy to move whole) so the new bath will go in tomorrow night, in 'shower only' mode. A mate who is a builder came round on Saturday and rubbished the whole thing, I think he's after the job. However as that will cost real money, he's no chance. Did Hayley mutter anything under her breath while she was smashing the bath? Or throw pointed glances in your direction? If not, you're doing remarkably well. Actually it's a fix - Hayley did offer, but Edmundo & I did the real hammering, Hayley was just posing in 'beautiful assistant' mode. Plaster dude is near finished now, it looks like a room in a new house all of a sudden! He works a lot harder than I do. I tried to post this last night, but I seem to lose the internet every evening now, when all the kids come home from school and go online to chat to old pervs pretending to be 15, and Facebook one another, whatever that entails. Anyway, plasterman has gone, leaving me with a passable imitation of a room in a new house . 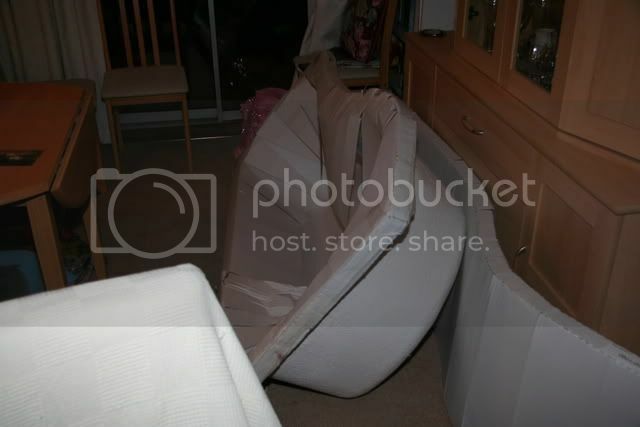 Yet again Photobucket can't see I rotated the image, and will take a day or 2 to catch up. 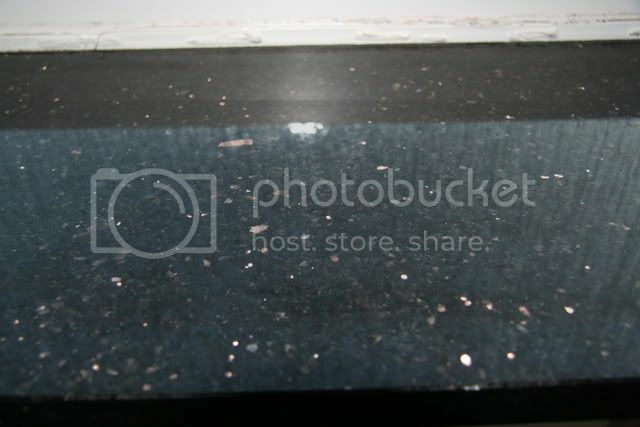 The granite windowsill, on his advice was stuck down with 'I Can't Believe It's Not Nails', and masked up with cardboard and tape, so he could plaster round it, rather than knock a groove in the plaster & force it in later. I went & bought lots of plumbing stuff last night, bath & shower may go in wednesday night, in the meantime we're on bucket flush and the kitchen sink as a bathroom. Hmm, I did have English UK selected, as well as 'English' US. Center and check are OK, so I'm a bit more English than American, if not quite there yet. Thanks for that, it'll annoy me less in future. We can stop turning up at friends' houses bearing towels and rubber duck now, the bath (eBay, �299) is in and running. No taps yet, but we can use it in 'shower' mode. At least if you measure things first it doesn't come as a surprise to discover the bath is a tad longer than the room (One tad = 2 midge's dicks) and we cut a rebate into the plaster at one end and the partition wall at the other. still not clear what we do with the curved side panel, which we haven't fitted yet. 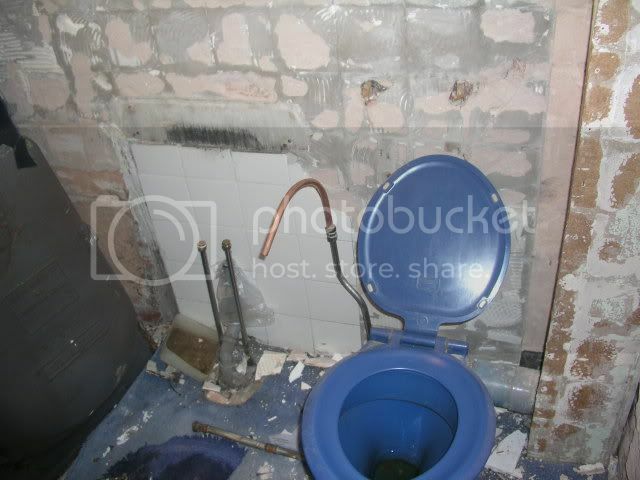 Here you can see the plumbing for the waste. So far the loo hasnt flushed into the bath, though we are still on bucket flush mode. Rather than a plug I used a sprung popup waste from Screwfix. 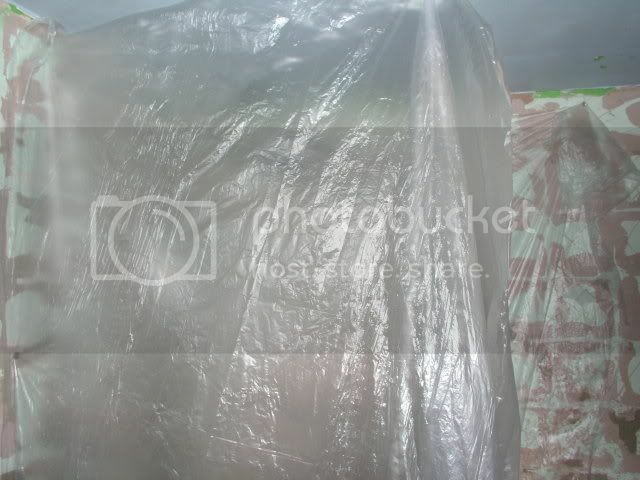 I re-put up the temporary plastic sheeting to make a shower curtain and protect the plaster. Not much to do till the plaster is truly dry, at the weekend we will have a go at the sink and new loo. Looking good. 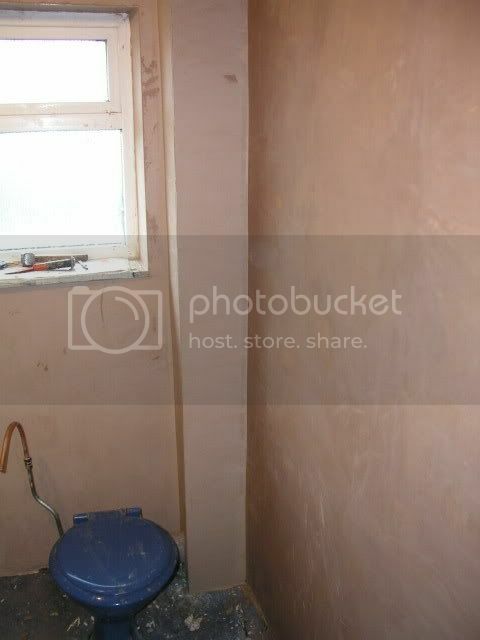 Have you fixed the bath to the wall, or is it free standing ?